I think this was my first time making (and having) twice-baked potatoes, but it's a fun twist on the boring old baked kind. Probably the most unique thing about this recipe is the addition of butternut squash, which gives a delicate sweetness and beautiful color to the filling. These are pretty easy to make, with probably the most difficult part being not breaking the potato skins (I'll explain later). 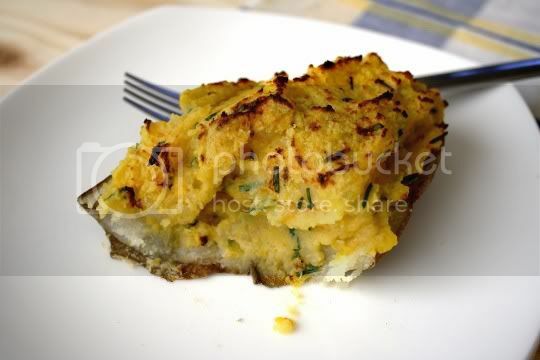 Simply bake whole potatoes and a halved and seeded butternut squash for about an hour, or until tender to the touch. When those have cooled enough to be handled, scoop the squash into a bowl and mash. Now the tricky part: halve the potatoes and scoop out the flesh into the same bowl with the squash...but leave a thin layer of potato in the skins. 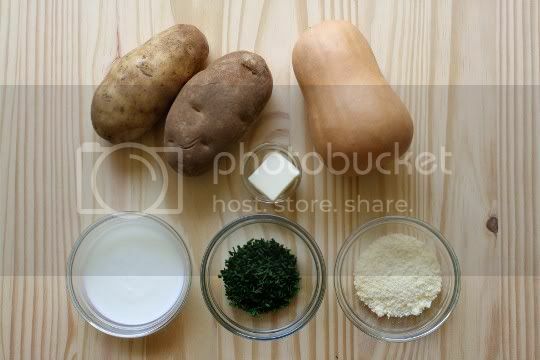 I suppose if you've ever made potato skins, you know what I mean. But be careful! If the potatoes aren't tender enough, you risk breaking through the skin (yes, like I did in a couple spots). Once that's done, mash together the potato and squash, then add butter, buttermilk, chives, and Parmesan cheese (plus a little salt and pepper to taste). Evenly divide this mixture for each of the skins, and stuff to the top. Broil until the tops are browned. Or, if you want to stop at this point and refrigerate the stuffed skins, you can do this too and broil before serving. The potatoes are delicious! Not only do you get the standard baked potato flavor with chewy roasted skins, but the butternut squash adds a wonderful sweetness and the buttermilk gives it some tang. The chives add a mild pungent onion-y flavor, and the Parmesan is earthy and rich. Make again? Definitely. 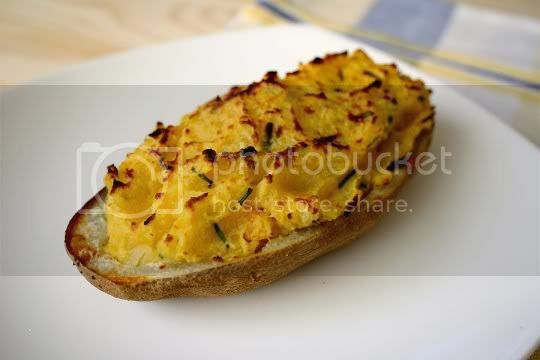 This makes a great side dish or main dish, and the fact that they can be made ahead is a plus! Vegan variation: Use a buttermilk substitute, vegan butter, and vegan Parmesan.